Internally displaced children play at the Debaga camp in the Kurdistan Region of Iraq. Photo: © UNHCR / Caroline Gluck Click to see larger photo. DEBAGA, Iraq — The battle for the northern city of Mosul could force a million people to flee their homes. 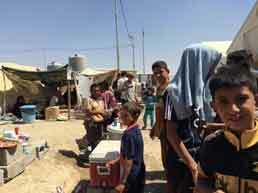 But even before it begins, aid agencies are struggling to shelter families displaced by the conflict against the Islamic State. The United Nations says it is nowhere near ready to deal with the fallout from the U.S.-backed offensive to retake Mosul from the militants, which could begin in less than a month.